Ladies and gentleman, prepare to board this plane called Beef Empanadas. Destination: amazing flavor! 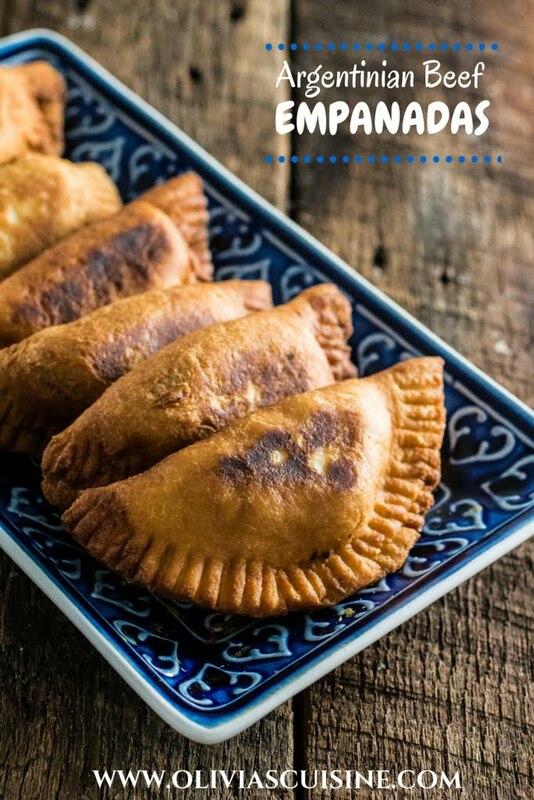 These Argentinian beef empanadas will transport you to Buenos Aires in one bite! It will be almost as if you are walking around Puerto Madero on a lovely afternoon, biting into your empanada that you just bought at a local shop. Except… you made it at home! Doesn’t it amaze you that food has this power? Transport you to a nice flavor vacation? Which nowadays is the only kind of vacation I can afford. Ugh! Tim and I are moving to our new apartment next week and, since the place is way bigger, we’ll have to buy more furniture! So, yeah… No vacation for me for a while. Except Christmas in Brazil, of course! But that doesn’t quite count, since it’s my home country… Does it? In my “real vacation” bucket list I have a trip to New Orleans (I’m dying to see that city and eat that food) and one to Europe, since I’ve never been. Oh yeah… I’m a foodie that has never been to Paris or Italy! Can you believe it? My fingers are also itching to register for this amazing food blogging conference in Cancún, at an all-inclusive resort. But I really really REALLY need to behave!! 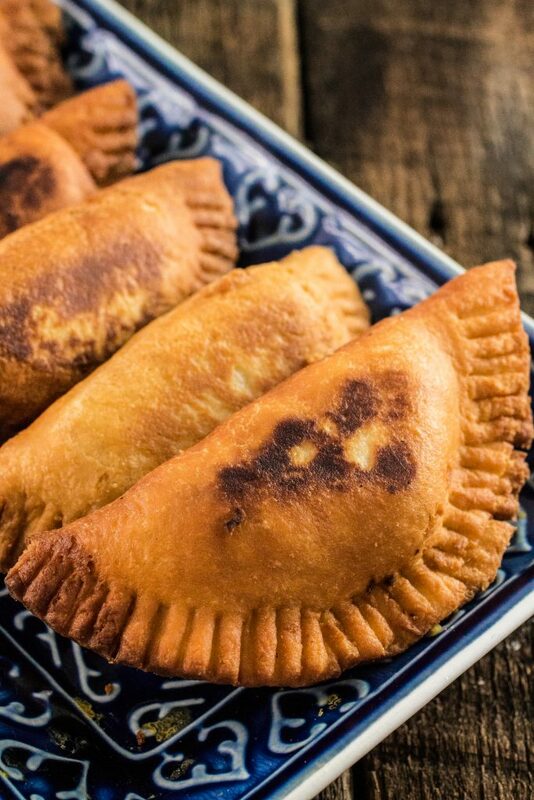 Even though I’m claiming those to be “Argentinian-style”, empanadas are actually originally from Portugal and the northwest region of Spain, called Galicia. 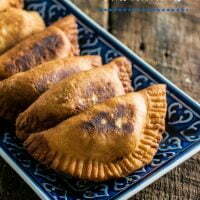 They are believed to have been influenced by the Indian meat-filled pies called Samosas, since the first empanadas started appearing around the time of the establishment of trade routes to India and the Portuguese colony in Goa. In Portugal and in Galicia, the empanada is prepared as a large pie and then cut into smaller portable pieces that people can take to work. Some of the popular fillings over there are tuna, sardines or chorizo! Sometimes even cod and pork loin. The Spanish and Portuguese colonizers brought the empanadas to South America where it developed into what we know as Empanadas in America. In Brazil we call it Pastel and we make it slightly different, with a flaky pastry-like dough, but that’s a topic/recipe for another post! In Argentina, the cuisine we are exploring today, the dough is often made with wheat flour and lard. The most popular fillings are chicken and beef (cubed or ground, depending on the region), spiced with cumin and paprika. 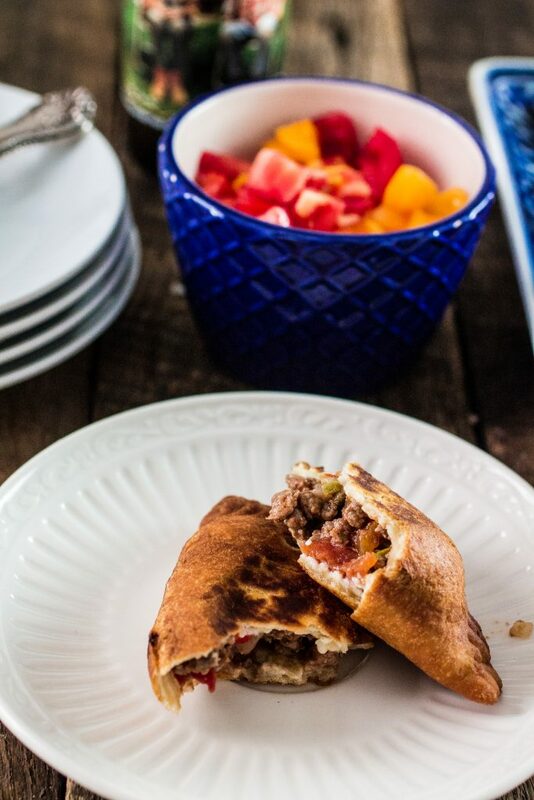 Sometimes they call it Spicy Empanadas and they add red pepper flakes for an extra kick! 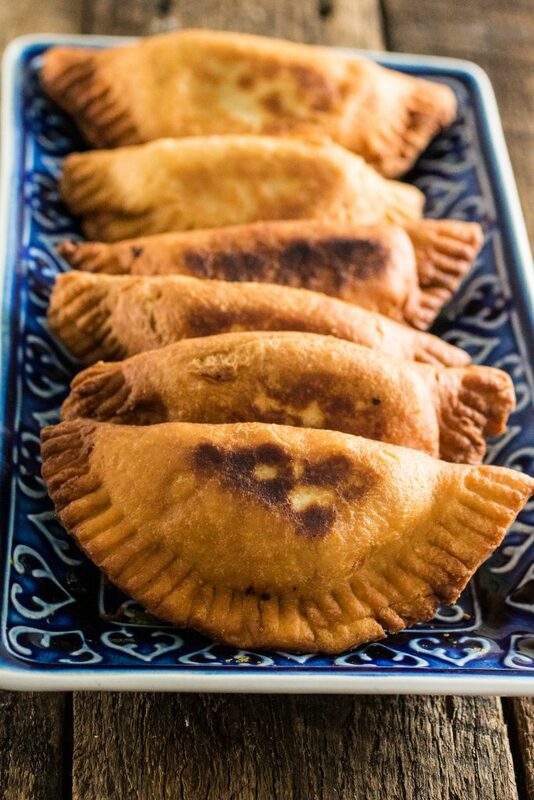 The empanadas we are making today are fried – Tucuman-style, which is the preferred type in Buenos Aires. However, you absolutely can bake it (Salta-style) and it will still be delicious! When I first experimented with this dough (recipe from the Gourmet magazine, October 2014 edition) I was a little scared of how my empanadas would come out. I’m used to eating empanadas that have more of a bread or pizza-like consistency, like a calzone, but I was really intrigued by the pie-style dough and was happy to use a recipe that used butter instead of lard. Mostly because… who has lard in their fridge? Not me! Oh. My. God, you guys! These are the best empanadas I’ve ever tasted in my life! They were a total hit in our home and we managed to devour two batches in two days. The filling was incredibly juicy – it helps if you chill your filling for at least 2 hours before making your empanadas – and the dough was crunchy on the outside and soft on the inside and oh so buttery and full of flavor! However, even though this is an easy recipe for empanada dough, I understand if you just don’t have the time for it. So, if you’re craving empanadas but don’t have the time to make your own dough, you can get empanada discs at the supermarket or at Amazon. Seriously… no excuse to go spend your hard earned money at the Empanada store when you can make them at home! I really hope you give this a try! In a large sauté pan, over medium heat, heat the olive oil and fry the onions and the garlic until translucent (about 2 minutes). Add the scallions and red pepper and sauté for a couple of minutes until fragrant. Add the ground beef, breaking the beef with a wooden spoon, until browned (3-5 minutes). Season with salt and pepper.Then, add the olives, the spices and the egg (if using) and cook until the mixture is moist but not too liquidy. Taste for seasoning and adjust to taste. Let the filling cool and bring it to the fridge for at least 2 hours or overnight. That will make the juices solidify, which makes your empanadas super juicy and prevents them from being soggy. In the bowl of a stand mixer, combine the flour and the salt and mix until incorporated. Add the cubes of cold butter and, using your fingertips (or a pastry blender), work the butter into the flour until the mixture resembles coarse meal. In a separate bowl, beat the egg, ice water and white vinegar together. Form dough into a flat disc and chill, wrapped in plastic wrap, for at least one hour. Place the filling in the center of the circle and carefully fold the empanada into a semicircle. Crimp down the edges with a fork. If necessary, wet your finger and rub it along the inside edge of the dough. To fry the empanadas, heat vegetable oil (enough to cover the empanadas) to 360F degrees and fry the empanadas until golden, about 2 minutes per side. I like to add a few cloves of garlic to my oil. It makes the empanadas even more flavorful! Transfer the empanadas to a plate lined with paper towel. If you think 12 empanadas is too much, don't worry! Leftovers taste great and you can reheat them in a preheated oven (250 degrees) for about 10 minutes! Alternatively, you can freeze the empanadas. 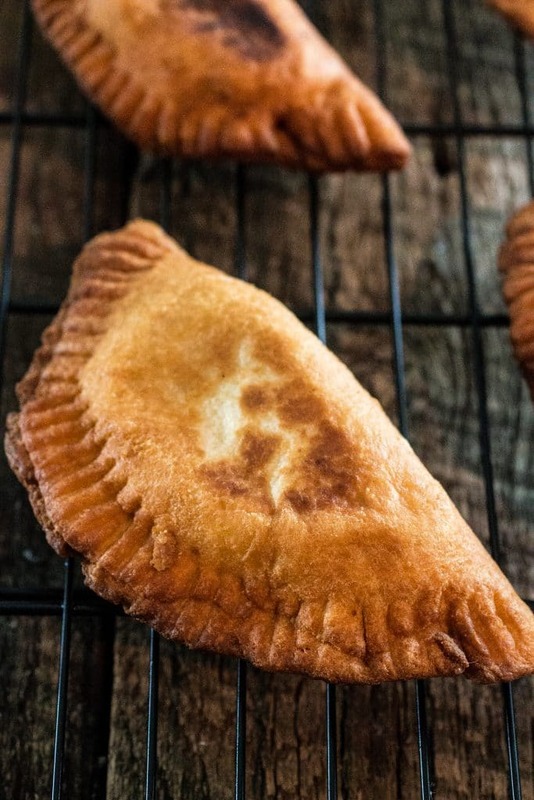 To freeze, lay unbaked empanadas side by side on a parchment-lined baking sheet. Make sure they don't touch, or the empanadas will freeze together. Freeze until solid, then transfer the empanadas into a freezer bag. 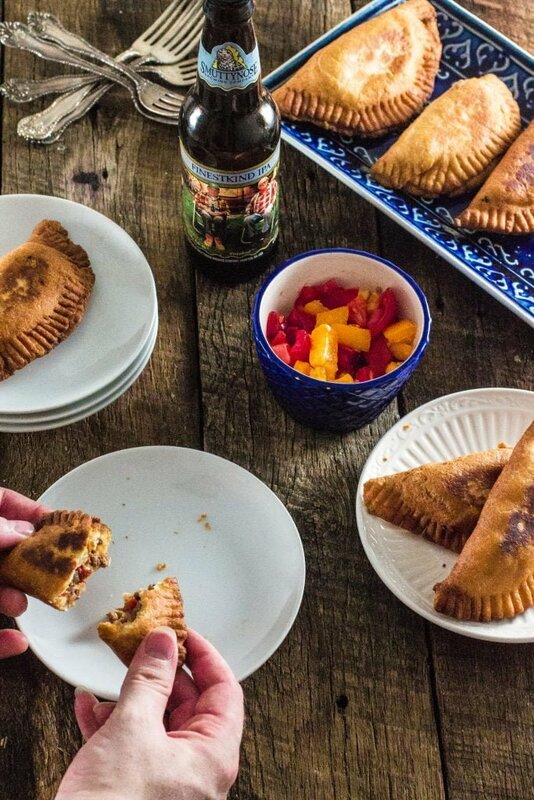 Frozen empanadas will keep for up to three months and can be baked straight from the freezer. Add a few extra minutes to the cooking time. I love empanadas.. well pastel de forno as we call it in Bahia. Yours looks delicious! So much to say :) forgive me in advance! First of all, I’m suuuper excited for you guys and your new place! Woot woot! I hope you love it.. and don’t let the move stress you out. Take it from me, I just moved as you know. The boxes will get unpacked.. at some point. Just focus on the getting your stuff to the new place so you can enjoy it part. Second, so NOT weird you haven’t been to Europe or Italy. I haven’t either, and the hubs is part Italian! Third, what’s this blog conference in cancun???? I wanna go!!!! Last and Sooo not least (!) These empanadas!! Girl, these look amazing! Love the flavors and the shell looks so gosh darn crispy, crunchy, and completely yummy!!! (<– fryer love!) I'm drooling! Totally making these! Pinned!!! Xo chicka! I’ve never made my own empanadas before – but I sure love eating them. These look delicious Olivia (and incredibly addictive I imagine too). Shopping for new furnishing is much more fun than blogging. I hope you got lots of good stuff! Thee empanadas look so good! I have to try making my own someday…and definitely fried. Yes somethings are definitely better fried, I never believe in baking the traditional things! Hope you had a good move dear, I know it’s a big thing and does take some time to settle in. after a month of living in the new house I can say I am somewhat settled but there’s still no furniture! haha…so much shopping to do! Love these empanadas and I agree, certain stuff just needs to be fried! Great pictures! These empanadas look delicious, Olivia! These are one of my favourite foods! Excited to try your recipe soon! Congrats on the new and bigger place! I love empanadas and now I’m inspired to make my own at home! I love your food history too! I always get an education when I visit you. Now, tell me all about this Cancun conference! Let’s all go! OOhhhh these look amazing!!! I usually don’t eat empanadas, but I will have to try this recipe!!! I made your recipe today. The first time for me to make empanada’s! They were good but not as good as I was hoping. The dough was easy to work with but I was hoping for a lighter, flakier empanada similar to the food truck here in the city! They were between a calzone and an empanada… Still pretty good though! Thanks for the effort! I’m on to trying to find a recipe that will give more of what I was looking for. Just returned from a trip to South America and I LOVED empanadas in Buenos Aires. I can’t wait to try this recipe to share our trip with friends! Thank you!